The best SE yet? We think so. A fitting accolade to 10 years of PRS SE guitars. Original PRS-inspired recipe. Build. Classic rock tones. Neck pickup. Price. Vibrato set-up. Limited colour choice. The guitar's top is gently contoured. The neck features old-school bird inlays. The standatrd of finish is as impeccable as ever. Neither Carlos Santana nor PRS Guitars need any introduction, and these two giants of the guitar world are long-time bedfellows. It was Santana's use of Paul Reed Smith's hand-made guitars in the early eighties that gave the fledgling guitar maker real credibility, although it wasn't until 1995 - 10 years into the life of Smith's company - that those original guitars were replicated for a wider market. "There are plenty of zinging highs that make for some bell-like clean rhythm tones with both pickups on and the volume reduced." The Santana recipe, you see, predates PRS: the original guitars Smith made for Santana basically used the outline of the double-cut Gibson Les Paul Junior/Special, but added a carved maple cap and vibrato. There were numerous other differences too, such as the headstock shape, inlays, switching and controls, which all predated Smith's eventual and now-classic Custom, which came to market in 1985. Beyond the USA-made models, it was Santana's name that was used to launch the SE (Student Edition) Korean-made PRS line in 2001. This stripped- down solidbody had little of PRS's cosmetic style and was swiftly upgraded in 2002. It's fitting then that 10 years on from the birth of the successful SE range, Santana should get another signature model, this time inspired by the original Paul Reed Smith guitars with which Santana is synonymous. So what differentiates this from, for example, the 25th Anniversary SE Custom 24? Outwardly, it would appear that it's just the body outline; the Santana's shape is more bulbous in the lower bouts, the upper horn stubbier, less graceful than the classic lines of the Custom. The top is lightly contoured too, the outer edges subtly chamfered - not arched like the USA models, but not flat like the SE Custom - and we have the usual belly cut on the back. Its basic construction is identical, however, with a very tidily jointed three-piece mahogany back (32.5mm thick) topped with a slab of maple and faced with a thin flamed maple veneer to emulate the much more expensive all-solid slabs of figured 'curly' maple that are PRS's visual hallmark. Overall, it's slightly thinner (46mm) than the US models; so it feels quite compact and is perfectly weighted at 3.6kg (8lbs). But there's another change too: for the first time on an SE, the scale length is reduced from PRS's standard 635mm (25 inches) to the shorter 622mm (24.5 inches) - a feature of the original Santana guitars and one that's creeping increasingly into high-end PRS models. The neck itself is one-piece mahogany glued in under the neck pickup so the protruding heel is part of the neck not the body. Thanks to that trademarked cutaway on the inside of the treble horn, top fret access is easy enough and with the wide-fat profile - a subtle 'V' in the lower positions rounding our to a fuller 'C' towards the body - the neck feels classic, comfortable and meaty without being too big. Oddly, unlike all of Santana's USA models, this has a 22-fret fingerboard instead of a 24-fretter. However, this isn't unusual for non-PRS guitars and is no deal-breaker for us. Like the Custom 24, we get 'old-school' birds cleanly inlaid on the very dark rosewood fingerboard and the nicely fitted frets that are slightly lower in height than on the USA models. Aside from that, the Santana follows the SE protocol with non-locking but adequate tuners, a Korean version of the PRS vibrato (with steel top plate and block) and very sharp construction, with nice little touches such as conductive paint in the control cavity and a foil-shielded backplate. Speaking of backplates, it might have been nicer, as on the original Santana guitars, to leave off the vibrato's rear cover altogether. The pickups are quoted on PRS's website as being 'Santana humbuckers'. "These are new pickups that Paul spec'd specifically for Carlos and the 24.5-inch scale length," explains PRS's Doug Shive. "We are referring to them as '245' pickups because we plan to use them on different models." Confusingly they have different specs to the existing USA-made 245 humbuckers. "I cannot divulge the amount of turns," continues Shive, "but I can say the US 245 pickups have a DC resistance of 8.75k ohm (treble pickup) and 8k (bass). They both use Alnico II magnets and both have covers. The SE 245 pickups have a DC resistance of 10.5k (treble) and 8k (bass)." They both use Alnico V magnets and neither has covers, so it seems that the names are the same and not much else! We've been more than pleasantly surprised by both the sounds and playability of SEs we've played over the past few years, and this Santana model is no less impressive. A light slinky action (it would benefit from 0.010s and not the supplied 0.009s, especially with the shorter scale length) makes for effortless playability. And once the strings had settled, the tuning stability is also very good, save for a tendency for the low E to go sharp with vibrato use - something that's been missed in the otherwise meticulous set-up. The bridge pickup (or treble, in PRS speak) exhibits a rock-ready punch contrasted by an altogether more vocal and hotter PAF-like neck (bass) pickup that'll certainly satisfy anyone chasing Santana's fluid, fat and clear tone. There are plenty of zinging highs that make for some bell-like clean rhythm tones with both pickups on and the volume control reduced, but plenty of smooth darker depth especially with a little tone control reduction. Crunchy amp tones produce taut classic rock riffage and heavier gains easily edge us into more modern metal. But it's that smooth-nosed yet clear neck pickup that really impresses, along with a quick attack to the note and easy sustainful musical feedback. It would be hard to pigeonhole this to a specific genre outside of simply classic rock: with a good amp tone and volume, tone and pickup adjustments any player young or old will find loads of sounds here. 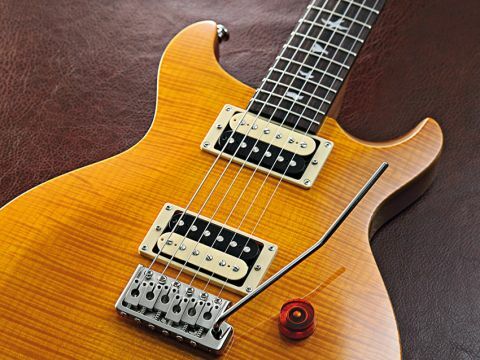 So this, the third SE Santana non-limited model, is not only informed by some of PRS's past history but is perhaps the closest PRS has thus far dared go to in replicating its USA formula at a lower price-point. No, it's not the 'real thing' but for many musicians it'll do just fine: a great working guitar, ergonomic, versatile, perfectly weighted and easily upgradeable.